I’ve probably mentioned it before on past reviews of EA’s NHL hockey franchise but I can say I have been playing hockey video games since the NES. One of my favorite memories on the NES was playing hours upon hours of Blades of Steel a game that I still can pick up and enjoy to this day. Needless to say although I am not an avid fan of the real life sport (I watch the playoffs) I have always loved the video games. Now EA is back a year after one of the franchises best outings to see if they can keep building upon the excellent building blocks already laid before it. So does NHL 12 have what it takes? Read our full review to find out. There is no doubt that the gameplay got a huge push forward in 2011 with an increased amount of animation and an increased focus on the action on the ice. I usually try to shy away from talking about tweaks to a games engine but there is a noticeable improvement on the action on screen. First off hits against the glass seem to have more of an impact while slight checks will only give a glancing shot. Much of these improvements are slight but if you played a lot of NHL 11 you will immediately pick up on the differences. The most noticeable thing about NHL 12 is just the crazy amount of content packed into the disc. It is starting to remind me of the last few years of the Playstation 2 when games like Madden and NHL were so packed with modes you had no idea where they were going to go next. The highlights to me are the Be a Pro and Be a Legend Mode. The only difference between the two are one you create a play (Be a Pro) and the other you take a legend of old (Be a Legend) and see how they would stack up in today’s league. The gameplay in these modes focus on the individual rather than the team and things can get a little hairy because of it. It still is a ton of fun to play and super gratifying when you make your way to the NHL. 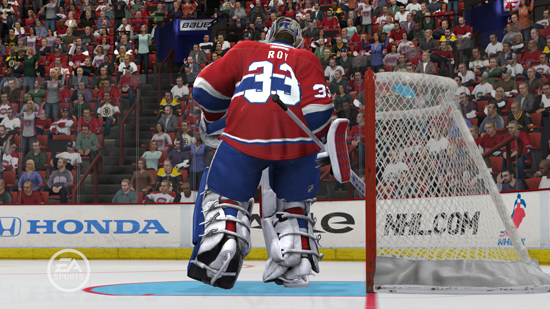 There is a huge value proposition when it comes to NHL 12. You have so much to do in the game that often times it can be hard to figure out which path to take. The game still however is at its best when you’re either playing with a friend in the living room or playing online against a random stranger. The human element is so prevalent in a hockey game that the experience is immediately improved dramatically because of it. 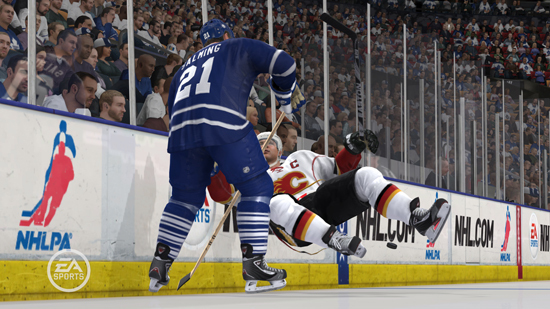 The big draw for NHL 12 is the gameplay and there is no denying that the developers of NHL 12 have totally nailed it. There are still some minor hiccups with the Be a Pro mode but that is overshadowed by all the amazing content that is packed into this package. One of the best parts of NHL 12 is the presentation. The game literally opens up with the Winter Classic, which looks incredible and is a great way to open up the experience. From there the visual style and presentation never miss a beat and put up one of the best visual experiences in a sports game of the year. For a hockey game the fun factor is sort of inevitable. Sure there have been bad hockey games but the sport manages to lend itself extremely well to video games. Whether you’re a die hard NHL fan or glance at the Stanley Cup playoffs when their on TV, NHL 12 welcomes you with open arms. There is a plethora of content to be found within the game all of which seems well thought out and is a pleasure to play. The game does a nice job of giving us an enjoyable hockey experience that does a good job of improving over last year’s version. For those of you who really need a heavy dose of hockey with this year’s strike should definitely go pick up NHL 2005.